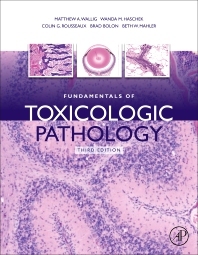 Fundamentals of Toxicologic Pathology, Third Edition, presents an essential overview of systems toxicologic pathology in a clear-and-concise manner. Toxicologic pathology integrates toxicology and its interdisciplinary components, including biochemistry, pharmacodynamics and risk assessment to pathology and its related disciplines, such as physiology, microbiology, immunology and molecular biology. This wholly revised and updated edition presents the newest information on the topic, and is an essential reference for advanced students, early career researchers, toxicologic pathologists, pharmaceutical scientists, medical pathologists and clinicians, and anyone involved with drug and device development. The book includes a new section describing the application of toxicologic pathology, such as diagnostic and forensic toxicologic pathology, environmental toxicologic pathology, experimental and industrial toxicologic pathology, and pathology issues in the design of toxicology studies. There are also new chapters on special senses (the eye and ear) and the biochemical and molecular basis of toxicity, among others.